Home › The Afterlife › What Does it Mean When My Parents Die? Will I See Them Again? I just stumbled upon your website in my spiritual search and I am glad I did. Over the last 3 years I have lost both my parents and these events have made me consciously aware of my own death. I used to feel more comfortable with what awaits us on the other side but I am now more scared than ever there may be nothing. I guess I am looking for some comfort that my parents are ok and I will see them again one day. Thanks. First, my thoughts are with you, Tom, on the loss of your parents. It is very common for us to contemplate the meaning of life and death when our parents’ time of death arrives. Whatever our relationship may have been with them, knowing that they are gone changes our view of ourselves. There is no longer an older generation above us. Now, in a psychological sense, we’re on our own. Now we have to think about why we’re here on earth, and about where we are headed in life and in our own eventual death. Are my parents okay, and will I see them again one day? What does my parents’ death mean for my own life? Let’s look at these questions in reverse order. First, this article is about when our parents die having lived out a reasonable lifespan, so that we, their children, are well into adulthood ourselves. I sense from the way you phrase things that this is your situation. As long as our parents are alive, even if we ourselves are well along in years, there is a sense that the older generation is still present and available for us to turn to. In an odd way, this is true even if they can no longer take care of themselves, and no longer have their full mental capacities. We may even be taking care of them. But assuming they were reasonably good parents, even then we have a feeling that those who took care of us, and who we turned to in trouble, are still here with us—even if they may be hidden away in a deteriorating physical body and brain that prevents them from being fully themselves. When our parents die, the reality settles in that they are no longer here. Whether they were healthy and with it right up to the end or spent years not being truly themselves before they died, there is a certain finality about death. The people who raised us and to whom we turned more times than we can count are gone. This causes us to re-evaluate our own life and to realize, sometimes with a shock, that we ourselves are now truly the ones in charge. There is no parental safety net to fall back on. Whatever we make of our life, that’s what it is. And of course, though we may have faced the death of friends and acquaintances, the death of our parents often hits much closer to home. It causes us to think about “ultimate things” in a way we may not have thought of them before. In short, whatever the circumstances of our parents’ death, that event causes a paradigm shift in our consciousness, our sense of life, and our sense of ourselves and our place in this world. I sense that much of what you are feeling now is not only about your parents, but about your own life, and its meaning and ultimate fate. Even though it can be uncomfortable to reconsider and question things that seemed so certain to us before, this is both a natural and a spiritual part of life. Ultimately, it is not good for us to accept things just because that’s what our parents instilled into us. Yes, good parents can be a great influence for good in our own life. But as long as we are living on their borrowed strength and values, our life is not truly our own. In a sense, the death of our parents is a wake-up call for us. It is a message from God, if you will, that we must now live our own life, make our own choices, and be fully responsible for ourselves in a way that may never have seemed quite so real when our parents were still alive. In particular, anything we have accepted automatically and without question, just because that’s what we were taught, is not a full and strong part of our own self and character. Beliefs and ideas that we have simply and uncritically accepted from others are borrowed values. Perhaps in our parents’ character they were tried and tested in the crucible of real life experiences. But even if we ultimately accept many of our parents’ values, we must make them our own by trial and testing in our own life and experience. In other words, no matter how fine and good the teaching and example of parents, teachers, ministers, mentors, and so on may be, those things are not truly our own until we have questioned them, tested them, tried them out, and hammered them into the shape of our own unique mind, life, and experience so that they are truly our own. And of course, many of us also have the experience of trying and testing things our parents taught us or instilled in us, and finding that they no longer fit. Many of us have the experience of replacing what we were taught as a child and as a youth with different beliefs and values that make more sense to us, and work better in our own life and experience. All of this questioning, testing, and working things out in our own mind is a healthy and necessary part of becoming the unique individual that we ourselves are. So as uncomfortable as is your radical questioning of issues of life and death that used to seem so comfortable and solid to you, this is a necessary passage as you determine for yourself what your own beliefs, loves, attitudes, and actions will be in this life. One way to look at it is that in dying, your parents have given you the gift of exploring life for yourself, on your own terms, and deciding for yourself what you want to believe and who you want to be as a person. Though this can be a scary and discomforting time, it can also be an exciting and adventurous time of renewal, discovery, and reshaping your life! If what I’ve written so far makes some sense to you, then perhaps you will understand why I believe it is actually part of God’s plan that in the ordinary course of life, there comes a time when our parents are no longer with us. For many of us, this means we have to feel that our parents are gone. Though there are many more questions we ask ourselves when our parents die, let’s look at these for now, and see if we can find some answers and some comfort. Beyond that, I would simply say, listen to your mind, and to your heart. There is more to life than logic and proof. There is the experience of the sages and deep thinkers of all the ages. And there is a response within our own heart when we encounter something that has the ring of deeper truth. So, sidestepping all the questioning, debate, and skepticism, for now I will simply give you my responses to these questions. Are my parents really gone? Your parents are gone . . . and they aren’t. They are gone from this physical, material plane of life, and from this earth—and they will never return. There will be no physical resurrection at some future Apocalypse. (See “Is the World Coming to an End? What about the Second Coming?”) Your parents’ bodies, whether buried or cremated, will “go the way of all the earth” (Joshua 23:14; 1 Kings 2:2) The materials of which they were composed will “return to the dust” (Genesis 3:19; Job 34:15; Psalm 104:29) of the physical ecosystem from which they came. And yet, your parents themselves are not really gone. Yes, you knew your parents through their physical bodies, their actions, their words. But your parents were not their bodies. It was their minds and their hearts that made them who they are. And those things are not physical. The spirit of your parents is still very much alive. Their true self is still very much alive. That’s because everything that made them who they are is not physical, but spiritual. It is their loves and beliefs, their character and their personality, their humor and their sadness, their wisdom and their silliness—and everything else that made them the unique people they are. What we here on earth call “death” is only the removal of the real person, which is the spirit, from the physical body that had housed it here on earth. From a spiritual perspective, physical death is the birth of a soul from the womb of the material world into the fullness of life in the spiritual world (see “When Death is a Celebration”). And though we cannot see spirits with our physical eyes, they are every bit as real and solid to themselves and to one another in the spiritual world as our physical bodies are to us here in the physical world. Your parents are still very much alive. And if you were close to them, and they cared for you, they are still present with you even if you are not consciously aware of it. In the spiritual world, thinking about people brings their presence. If your parents are thinking of you, then they are still subtly present with you in spirit. Where are my parents now? Here’s the funny thing. Since your parents died within the past few years, they might be living a life very similar to the one they had lived before they died. If you like, you can picture them living in a house similar to the one they had last lived in before they died, and going on about their daily lives with one another and in their community. Of course, they will no longer be with the people they left behind who are still alive here on earth. But they will be meeting and greeting old friends and family members who passed on before them. They will be reigniting old friendships, and finding joy in reuniting with the people whose passing they had mourned while they were still alive on this earth. To answer this question more technically, it is most likely that your parents are now living in what Emanuel Swedenborg called “the world of spirits.” This is a vast region of the spiritual world situated between heaven and hell. It is where everyone who dies first goes immediately after death. Some stay there only a short time. Others stay for as long as the equivalent of a few decades here on earth. Everyone stays there as long as necessary to get their lives sorted out and to gain clarity about who they truly are in their real, inner self. How are my parents doing? During the course of their time in the world of spirits, your parents will gradually grow younger in body, until their spiritual body—which is just as real and solid there as our physical body is here—regains its youthful strength and vigor. Do you have pictures of your parents when they were young? If so, that will give you some idea of what they are starting to look like now. It doesn’t happen all at once. But before long, they will leave behind all of the frailties of age, and feel young and strong again! That’s because in our minds, even when we are old we are still young. Toward the end of his life, my own father forgot everything that just happened more than about ten minutes ago. But he would regale us with stories of how he met his bride (my mother) over sixty years ago. He would tell us over and over again how she would put on her jeans and jump behind him on his motorcycle so that they could go for a ride together. “That’s my gal!” he would say! Now, I don’t know if my father will get himself a pair of wheels in the spiritual world. But I wouldn’t put it past him! If you can picture your own parents in their younger years, enjoying the pursuits and pastimes that they did in those days, then perhaps you can gain some idea of how they are doing, and what they are doing. Of course, there’s more to the spiritual world than fun and games. Your parents will now be opening up their hearts and minds in a way that they may never have been able to do fully while they were still alive in the material world. Social strictures and obligations often suppress our full personality, expression, and joy of life here on earth. In the spiritual world, those external strictures are taken away more and more, until we can fully express who we truly are, heart, mind, and soul. Did you have a glimpse of who your parents were in their heart of hearts? If so, then you can get some deeper sense of how they are doing, and what they are devoting their lives to now that they no longer have to worry about social customs or money or death or taxes. In short, assuming your parents were good people, they are doing better than fine. Every day they spend in the spiritual world, they are able to express themselves more and more fully, and live more and more of the kind of life they truly love. Will I ever see my parents again? When it comes our time to die, and we leave behind this physical world and enter the spiritual world, we will be able to meet and get together with all of the friends, family, acquaintances, and coworkers who have died before us. Simply by thinking about them. As I said earlier, in the spiritual world, when we think about someone it causes them to be present with us. Of course, it’s actually a little more complicated than that—but there’s no need to get into the complications now. In the spiritual world, when we think about someone and want to see them, it brings us closer to them. The very act of thinking about them carries us into the same spiritual “space” that they are in, so that we can see them and talk to them. When our time to die comes, it is very natural for us to think about the people we loved who have died before us. And because we are thinking about them, it is very likely that they will be the first ones to greet us when we wake up in the spiritual world. From the brief words in your spiritual conundrum, you seem to think of your parents with love and affection. And I suspect those feelings are mutual. So I fully expect that you will see them soon after you die. You will then be able to spend as much time with them as you want. These are not my own ideas. I did not pull them out of thin air. Yes, I’ve spent many years contemplating the afterlife, and coming to some of my own conclusions. I’ve also read many accounts of near-death experiences, and found them confirmatory of what I had already believed about the spiritual world. I even wrote a book about near-death experiences almost twenty years ago, called Death and Rebirth. However, if you want the real story of the afterlife from someone who spent many years exploring that realm while still living here on earth, the book for you is Heaven and Hell, by Emanuel Swedenborg. For a little more background on Swedenborg before you take the plunge, see: “Who was Swedenborg? What Should I Read?” This post and video also offer links where you can purchase Heaven and Hell as a print or Kindle book, or download free PDF and E-Book (epub) versions. Beyond that, all I can say is: Read the book! Then decide for yourself whether the spiritual realm that Swedenborg described in vivid detail over 250 years ago makes sense to your mind . . . and to your heart. When you talk about “spiritual” world do you mean “heaven”? Any books that you can recommend about this subject. I miss my mom so much and I feel guilty about going on with my life and she is not here. We had so many plans and now I just feel completely lost without her. All of your feelings are very understandable. It’s a huge change, and it’s going to take time. I would suggest, however, that your mother would want you to go on with your life, and do good things with it. If nothing else, that way you’ll have some good stories to tell her when it comes your time to join her in the spiritual world. But more than that, I believe she would want to see you happy and fulfilled in this life even if she can no longer be with you here. She loves you and cares about you, and wants you to be happy. The spiritual world, as I believe in it, includes heaven, but also hell and a place in between called “the world of spirits,” where everyone who dies first goes to get sorted out before finding their final home in either heaven or hell. There are several more articles linked from the end of this one that you might also find helpful. Heaven and Hell, by Emanuel Swedenborg. This, I believe, is the most complete and satisfying account of the afterlife ever published. I am a Hindu. I lost my Grandma recently whom I loved a lot and missing her badly. Will I ever get a chance to meet her again(probably after my time)? I’m sorry to hear about your grandmother’s death. It is hard to lose the people we love, even if there is a time for everyone to leave this earth. From my perspective, it doesn’t matter if you are a Hindu or any other religion on the face of the earth. I believe that you will see your grandmother again when it comes your time to leave this earth, and spend as much time as you want with her. Meanwhile, she is rejoining family and friends that went before her, and growing young again in body as well as in spirit. Few questions,will i meet her irrespective of heaven or hell, and will she have the same body above as when she left or there will not be any physical body? Hell would be an issue only if either you or your grandmother is/was a wicked, selfish person. Assuming your grandmother was a good person, and that you don’t live an evil, selfish life either, you don’t have to worry about that. But yes, even people in hell can at least briefly visit with people in the world of spirits, where we first go after we die. However, over time relationships separated by the divide between heaven and hell will fade as the one who goes to heaven makes new friends and gains a new family in heaven, and the one who goes to hell becomes fully immersed in the hellish culture that exists there. In heaven, everyone sees each other as brothers and sisters, and sees God as their father and mother. Your grandmother will have a body, but it will be a spiritual body rather than a physical body. However, it will look and feel just like a physical body. Though you may at first see her as an old woman the way you knew her here on earth, in the spiritual world her body will grow younger until she is once again a young woman in body, even while retaining the wisdom she had gained through her long life here on earth, and through continuing to grow in wisdom in the spiritual world. My mom passed away a month ago. We were inseparable, we spent our whole life together and never ever wanted to be apart. She said we were intertwined…like the same person, the same heart. I know she would want me to be strong like her and live on but she was my only happiness in this world. Whats the point of living if i cant share it with the only person i want. And she was the only love and truth ive ever known in life. I just want to die so i can be with her. Im afraid shes alone or scared or confused that shes now a spirit and away from me. Life feels pointless and empty without her, im all alone and feel lost. If the meaning of life is to love and be loved and have happiness, how can i without her?? I feel like im paying a debt of grief and pain for the rest of my life in return for having 36 years of pure love and joy with her. She said she would always be with me no matter what even if she passed away. What if shes not with me, what if shes forgotten me??? I’m so sorry to hear about your mother’s death. I hope this article has been some help and comfort to you. Please be assured that your mother is fine, even if she will miss your physical presence. She is in a brighter world, where there are loving angels to help her in any way she might want or need. Whatever physical illnesses or disabilities she might have had toward the end are now gone. She will have the full use of her mind and her (spiritual) body—in fact, even more than she ever had here on earth, because she is now free from the limitations of this physical world. Although you and she are now physically separated, she is still with you in spirit. She can sense your feelings and something of what you are going through. She knows how hard it is for you right now. She can feel your pain. She will hope for you to be able to move forward with your life and do something good with it, so that she can feel that you have some sense of happiness and fulfillment in life. I know it’s hard. But for her sake, do keep putting one foot in front of the other each day, until you can find some comfort and peace. I feel like no one understands our deep connection. I dont want life without her,shes all that mattered to me. Yes, and she is still with you, even if you can’t see her with your eyes. If at any time you sense her presence, that is not just a hallucination or wishful thinking. She is with you in spirit. Can two spirits remain together forever in the afterlife? Yes. In heaven people who love each other and are very close to each other live near each other, or even in the same home. Both of my parents passed away in 2018, six months apart from each other. I also lost my canine soul mate in between them. I am having extreme difficulties with all of this loss. My question is: Will my parents always be my parents inn heaven. It’s funny to think that if they are, we will be the same age? I heard that everyone never ages passed 36. Hard to imagine my parents being the same age as me. I would love your thoughts on this. 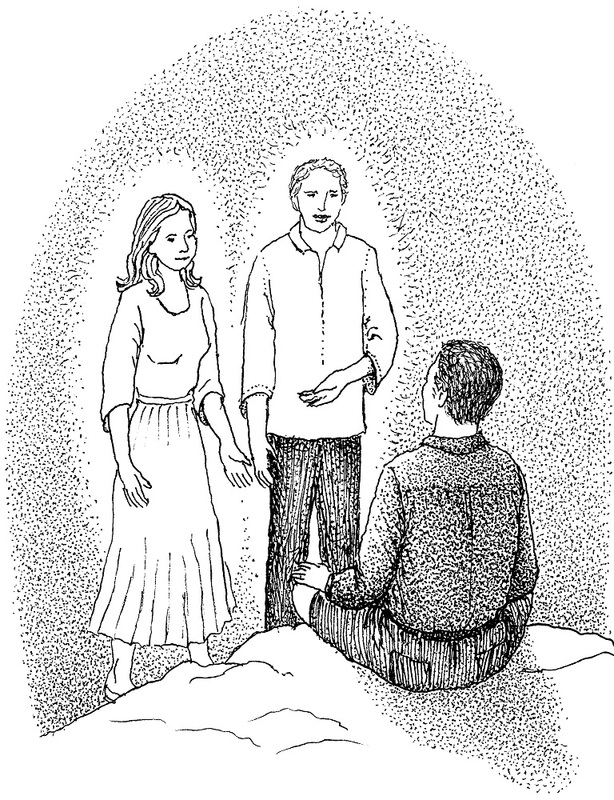 In answer to your question, your parents will be your parents in the spiritual world as long as you need them to be. Still, every good parent looks forward to the time when their children will be adults and their own people, living their own life, no longer dependent upon their parents. Isn’t that the goal of raising children to adulthood? Further, in heaven, everyone things of God as his or her divine Father (or Mother), and thinks of other angels as brothers and sisters. If you were very close to your parents, it is quite possible that you will continue to live in the same community of heaven that they do. However, as “time” (in heaven there is no “time” as we know it) passes, you will more and more think of one another as beloved brothers and sisters, and the former parent/child relationship will fade in favor of looking together to God as your divine Parent. I know this may not be exactly what you want to hear at this time in your life. And so I’ll return to my original statement that in the spiritual world, your parents will be your parents as long as you need them to be. You will meet them again when it comes your time to die, and you will have “all the time in the world” to reconnect with them and make up for lost time. Thank you for your reply. My parents, as commonly told by their children, were everything to me. I took care of them for the last 10 years as they were both very sick. The love bond between us was so great. There is nothing better than the “Pure” love between a parent and their child. And that is what I had, and what I am truly going to miss. I could always count on them. Everything could go to “hell and a handbag” but as long as I had them in my life and their love, it was okay. But now that they are gone. WOW, the grief is so intense. Even having my beloved beagle, Heidi by my side (I called her my copilot) because she helped me navigate my life after my dad passed. And now she is gone. Your right! I don’t ever want to think differently. When I go to heaven, I want my parents to be my parents and not my brother and sisters. It is hard to think with my logical brain right now, as I am being ruled by my heart now. I just want the relationship that I had with my parents to continue in the next life. I would hope that God would see the intense love bond I had with them and would grant me this. I know that God is everything, our “Creator” our “Heavenly Father”, but I also have another father and mother that raised me here, on this earth. I guess what I am saying is that I could “physically” have my mom and dad’s arms around me when I am sad. I could “physically” see and hear the words of love from their mouths. I have not had that “physical” relationship with God here. I would hope that he would not take that away from me. Don’t get me wrong, I do love God, but am I being selfish by saying that I want both? You will be able to have your parents’ “physical” arms around you in the other life for as long as you need that. We have spiritual bodies in the spiritual world, and they are just as real, touchable, and huggable as our physical bodies are here on earth. So that part of your longing will be fulfilled. The more immediate issue you face is the grief over their passing from this world to the next so that they are no longer physically present with you, together with the loss of your dog, so that you are left alone. This is difficult and very painful. That’s all there is to it. All I can suggest is that as hard as it is, you continue on with your life, and find reasons to move forward and accomplish something here on earth. Your parents will not want to see you spend the rest of your life pining away for them. They will want you to have a life here on earth, and some satisfaction, and yes, even joy in your life—as hard as that may be for you to conceive of right now. Be aware that your parents are still with you in spirit, even if they are not physically present with you. They can still feel your feelings and sense your thoughts—and even more than they could here on earth, because they are now in the spiritual world, where thoughts and feelings become visible and are seen and felt very distinctly. When you are sad and grieving, they feel your sadness and grief. When you are feeling happiness and satisfaction, they feel that as well. So even if for yourself you would never move out of your current grief, for the sake of their happiness in the spiritual world I would encourage you to gradually move toward some happiness and satisfaction in life, whatever that may mean for you. I know it’s hard. There is no “easy guarantee” on life. But facing the struggles of this life is what builds the character we bring with us into the next life. Besides, you’ll want to have some good stories to tell your parents when you arrive there! Thank you very much Lee for your words of wisdom and encouragement. As hard as it will be, I will try to get on with life. God Bless!